It's like a bucket of pearls. Lovely, fragrant, iridescent pearls of yumminess. If you have never smelled or tasted a muscadine, I am sorry. They are wonderfully pungent and tasty little baubles that make good jelly and great wine. A sweet friend has the most gorgeous muscadine vine growing on the fence around her pool. She allowed me to come pick to my heart's content and I ended up with about half a stock pot full which was just the right amount to make some jelly. I had never made this before and I used about three different recipes but in the end, it all worked out. I also wish I would have done this in a smaller batch, maybe half the size, then it wouldn't have taken so long to boil and gel. Almost no recipe used a gelling agent but after 30 minutes of boiling, I was getting concerned at the distinct lack of gel-age going on so I panicked and threw in the Sure-Jell. At any rate, the result was darn tasty! Wash muscadines and pick out any bad ones. Put muscadines in a stock pot and cover them with water. (I covered them a couple of inches.) Boil the fruit and water for about 30 minutes. Turn off the heat and give the grapes a good mash. Put the lid on the pot and let it cool. Once cool, put in the fridge overnight. The next day, give the grapes a good mash again and strain out the pulp from the juice. You may want to do this more than once if you are particularly concerned about clear jelly. I wasn't entering this in the County Fair and was impatient so I only strained it once. Measure the amount of juice. I ended up with 10 cups and I used 15c sugar. Bring the juice to the boil and dump all of the sugar in at once. Bring the mixture back up to a boil, stirring regularly. Stir in the Sure-Jell (if you need it). Ladle into hot sterilized jars and seal. Process for 15 minutes or wait until cool and stick in the fridge. You are exactly right that is a bucket of pearls. 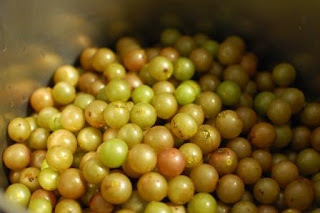 I just love Muscadine's and haven't had any in years. Just remembering that great flavor, and your Jelly recipe looks awesome. If you have left overs send them on over here. Hope you are having a fabulous weekend and thank you so much for sharing with Full Plate Thursday.